I have already told you about painting a red accent wall in our bedroom. There were a few pieces of trim to fix, but all in all the accent wall in the bedroom is complete. Because we had painted some sample paints on two of the three other walls in the room we had to paint the three other walls so they would all be the same color. Why we didn’t put all samples on one wall to start is beyond me. It would have saved us some serious time to have left those walls as is. There was builders grade paint already on the walls so we considered doing touch ups to the walls instead of picking a brand new color. When we went to the Duron store to buy the paint and they told us that color/style only comes in a 5 gallon bucket. That was WAY too much paint and the cost wasn’t so pretty. Back to the drawing board we went. While searching for a shade of gray for the living room I had picked up a Sherwin Williams color wheel. We decided it was as good a place as any to start the search for a white/cream color for the bedroom. 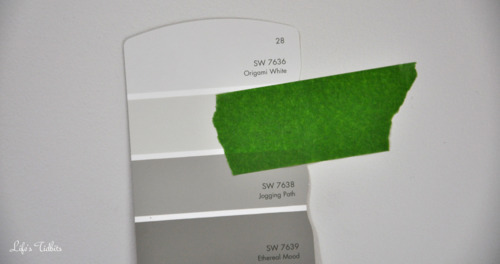 Quickly we realized Origami White (7636) was very similar to the color already on the wall. It was slightly lighter and had more gray/brown tones and less yellow in it. We taped the swatch up on the wall for a few days to make sure we liked it. As the designated paint runner I was off to Sherwin Williams to pick up the paint once we decided to go with Origami White. I was concerned one gallon wouldn’t be enough paint for the three wall and inside of the closet and the husband was convinced 1 gallon was plenty. He could tell it was making me nervous so we agreed on buying a gallon and a quart. This way we had a quart of paint as back up for the closets OR if we mark up the walls while moving in. I purchased the paint in satin, which is pretty much the same finish as eggshell. After my last mix up with paint finish I looked up satin vs. eggshell before allowing the SW employee to place my order. It took me about two hours to paint the edges and three walls in the bedroom. I also managed to put about 3-4 spots on the ceiling when using the roller extension. Oopsies! But that wasn’t the only oops that happened while painting the bedroom. Sophi backed onto the lid of a paint can while trying to rescue her ball from the plastic wrap. Before I could grab her she promptly ran onto the small patch of hardwood floor that wasn’t covered in plastic. 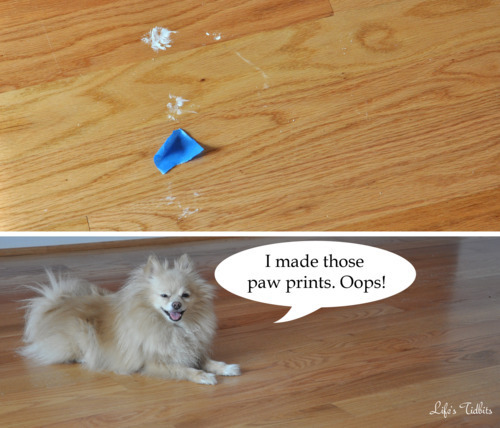 So we had three little white paw prints on the floor to deal with. Luckily after allowing the paint to dry on the floor we were able to scratch it off with finger nails. Looked like nothing had ever happened. As I pulled off all the tape and threw the plastic on the floor away I started to realize our bedroom was 95% completed! I grabbed the can of ceiling paint and touched up the couple of spots I had inadvertently painted. Then I screwed the light switch and outlet plates back on and what do you know it looked like a real room again!! Although I would like to call the bedroom a wrap we still have a few things left to do. 2. Decided upon, purchase and install blinds. At this point we are 4 days away from move in. I am not convinced we are going to be able to get all that completed before we move in. Our currently place is only 1/2 packed and the movers arrive Saturday morning at 8am. We better get a packin’ don’t you think?!?!?! We are hoping to at least complete demolition on the closets so the dust doesn’t get all over our furniture. Cross your fingers for us! !